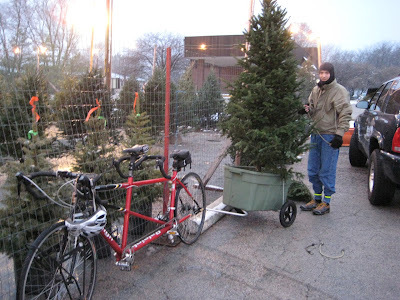 I was actually being sarcastic when I suggested to Rob that we go pick up a Christmas tree on our tandem bike. But he called my bluff and took me up on it. The whole endeavor was made more interesting because when we woke up this morning, the world of Urbana was covered in snow. Finally this afternoon we rode Big Red through the slush over to the Custard Cup parking lot, which is where they sell Christmas trees every year. It wasn’t actually too difficult to pick one out, given that there were only a few trees in our price range. 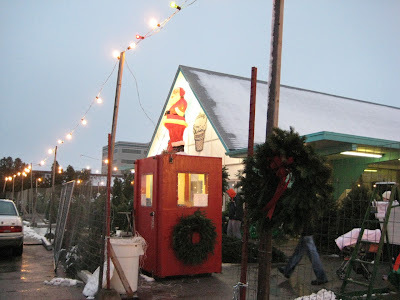 The day after Thanksgiving, the Custard Cup parking lot transforms into a Christmas tree lot. We bought the tree and Rob used bungee cords to secure it to the make-shift trailer he had constructed. Then we headed for home. It probably wasn’t the safest ride we’ve ever done. By this time, it was after 4:30 and becoming dark, it was sleeting a little bit, and with a 7-foot tree strapped to the back of the bike, we couldn’t see if there were any cars behind us. It was kind of scary every time we had to turn a corner or come to a stop. But luckily we only had about 2.5 miles to go, and we made it home just fine. I was a little disappointed not to have a photo or video of the adventure. I’d been hoping to stage a victory lap around our block so we could get some photos, but by the time we made it back, it was getting dark and I was convinced that all my fingers and toes were frostbitten. I can only assume that this will now become a Ragfield Tradition. Hopefully next year we’ll ride over to pick out our tree before the first snow of the season. You and Rob are now officially the coolest people I know.